Just in case you were worried that a python outbreak wasn’t enough, there’s another top predator in southern Florida. This past fall there have been sightings of Nile crocodiles south of Miami. This presents a bit of a conundrum for wildlife supervisors. You see the Nile crocodile is on international threatened lists, and is disappearing in its native habitat. Because Florida, however, is not its native habitat, and because the state already has to manage with non-native snakes eliminating the mammal population, the U.S. Fish and Wildlife Service has authorized a state shoot-to-kill order. Though there are native crocodiles in Florida, the Nile crocodile is known to be fiercer and more deadly, and is one of the few animals left on the planet that still hunts humans. While Nile crocodiles haven’t reached the infestation levels of the python, they are potentially more problematic in smaller numbers. FWC officers suspect that the crocodiles may have originated from an illegal captive breeding facility, but it is still unknown exactly from where they are coming, or how many there are. Again we are faced with the same unresolved questions on how to handle non-native species that can drastically alter a habitat. Do we preserve a threatened species, one of the greatest and most resilient in history, or do we hunt down the crocodiles before they make other animals endangered or extinct? Or do we simply pit the pythons and crocs against each other in a winner-take-all showdown on prime time? Either way, it’s hardly an enviable decision for the FWC. Congress has been consistently asked to ban the importation of pythons into the United States, which Congress has failed to do. This is an error on Congress part; as recently as October 17, 2011 a 16 ft. long Burmese python was discovered in Florida with a 76-lb. adult female deer inside. This is an example of the long drawn out debate regarding native versus exotic (invasive) species. 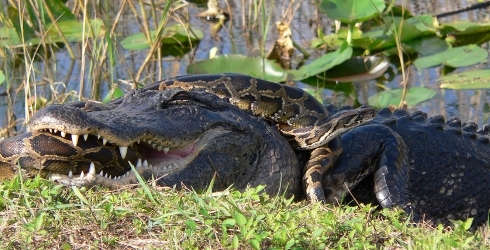 Unfortunately this illustration is not rare or unheard of; in 2005, a python burst in the Everglades after attempting to swallow a live 6-ft. alligator. It was not the fist documented event, and unfortunately not the last. Both Flora and fauna exotic species can be considered pests. Last month, a red-bellied piranha was caught by a 15-year-old boy. 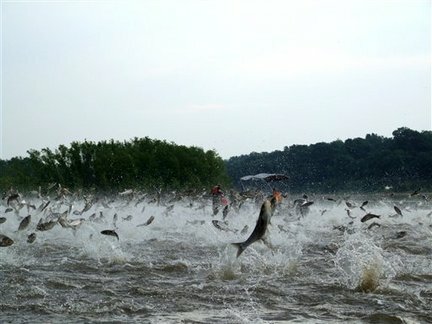 The next day, fish and wildlife officials caught two more in the same lake. No, this didn’t take place in the Amazon; it happened in West Palm Beach, Florida, The Piranha is not a Florida native, but, like the New York Snowbirds, these animals like the heat! From south of Florida’s borders, these non-native animals have invaded Florida due primarily to negligent pet owners. When pets becomes too large, people simply release them into the wild without thinking of any consequences. The pets survive and flourish in Florida because the conditions are so similar to that of their natural ecosystem.